And the lackluster Minnesota Week continues. Guess what. I still don’t want to be doing this. Oh well. I promise, that’s the last complaint you’ll hear out of me for a while. So. Now I’m pretty much stuck with actually reviewing a record. Let’s get to it, I suppose. 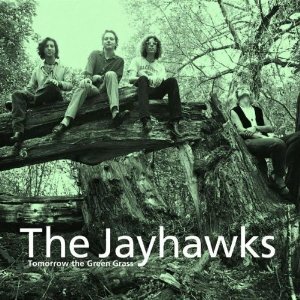 The Jayhawks are one of those bands that I can’t really describe. Throughout Tomorrow The Green Grass, I heard all kinds of different genres coming together. There’s some folk, some country, maybe even a little bluegrass mixed in. But there’s also a definite indie-rockish sound to it. Wait. Alt-Country. Duh. Sorry, I just remembered that this type of music really can be described. Think early Wilco. Except this record came out before Wilco formed…still, it’s a valid comparison. So, what do I think about this record? I know that’s the question that you’re all dying for me to answer. Believe it or not, I think it’s pretty good. I’m not sure why you wouldn’t believe it, but something has to take up those 250 words. Sure, Tomorrow The Green Grass does sound a little more polished than what I usually listen to—the band definitely had access to a real studio when recording this. That’s how alt-country should sound, though. The cleanliness is part of its appeal. Minnesota Week has already proven to be a great idea. I would have never checked out this band if it hadn’t been for MW. This state has some good tunes.